i want to design lifting lugs that made of aluminum in order to lift a plate and i want to know if there is a standard for this purpose. What references have you looked at so far? Is the plate also aluminum? What is your background, and how much do you know about welding and lifting plates? Chicopee gives good advice .. The devices are made by Crosby (and others) are called "plate lifting clamps" and they must be used in pairs. There are both Horizontal lifting clamps and Vertical lifting clamps. You must know the plate thickness and total weight before you can select a pair ..... also. how far must the plate be moved and must the plate be rotated 90 degrees ???? I need to design round eye plates from aluminum and and this eye need to be weld to plate (made from aluminium either). I know that for round eye plates that made from steel (st 37-2) has a standard and i wonder if there is standard for aluminium. In order to know the factor of safety for this eye there is The Air Force Method. In my work i engage in lifting appliance and i just started before a week. Get a copy of ASME BTH-1, latest ed., that is, “Design of Below-the-Hook Lifting Devices.” That is about as good a standard as any for this type of lifting equipment design. 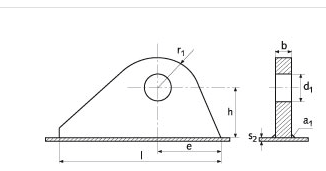 Also, get a couple good Strength of Materials, Machine Design and Theory of Elasticity textbooks for the general, basic engineering principles involved in this type of design. You will have to do some adjusting from steel to aluminum in terms of mechanical properties, strengths, welding, and manufacturing methods, etc., since most of these texts and stds. are written around steel materials and construction, but the basic engineering principles remain the same.. Thank you for the information: Your reply is EXACTLY why we frequently "force" a person to address the background of the problem. Can you see the great difference between a clamp made out of aluminum that will hold an aluminum plate or bar, and an aluminum lifting lug permanently welded to an aluminum plate? As you look up the references cited above, as a new person, KEEP YOUR BOSS INFORMED about what you are doing, and what your references will be. Be a record in your notes of each source. Your company will likely already have aluminum welding procedures qualified, and qualified suppliers and aluminum specifications already listed. Use those lists. Do not invent a pyramid while trying to fix the pothole in the road. There have been several threads on these fora discussing design of lifting lugs. Search on "design of Lifting lugs" .... be aware that these devices are also sometimes called "padeyes"
BTH-1 has some discussion on Factors of Safety (FoS) and they go as high as 5 for parts which are used in the lifting process many times, over the years, such as shackles, slings, chains, etc. and on down to 2 or 2.5 for a permanent lifting lug on a piece of equipment, used only once for installation and once again for removal, and otherwise is in a protected environment. These types of components are often proof tested to 1.25 times their design load. Quality and clean detailing for load path, etc. and good welding so as not to introduce stress raisers are very important consideration in good design of these components. Keep in mind that welding on most aluminum components, as shown in your sketch, seriously reduces their strength, right where you need it most. It is most likely good that you don’t show a CJP welding, but rather fillets all around. Get copies of AWS welding codes for steel (D 1.1) and aluminum (D1.2) if you are going to be doing this kind of design work. You might be better off with a bolted lug detail, of some sort, which allows you to take full advantage of the tempered strength of the alum. Your detail again…, generally, you do not want to bring that thick a lug (pad eye pl.) down onto a very thin pl. on the lifted item, where you are depending upon pl. bending for load transfer. You want a more direct, cleaner load path, into a web or a stiffener of some sort, which distributes the load better. At the actual lifting pin hole, and because of the reduced mech. props. of the alum., you might want to bush a larger dia. hole in the alum. with a snug fitting steel bushing which has an i.d. to match an appropriate shackle. What kind of a part or machine/structure is this, that the lifting lug has to be made of aluminum? Also, aluminium "loses strength" when welding. Use the zero temper values to be conservative, or make sure you account for this in another way. Will a lift beam be required for the lift ?